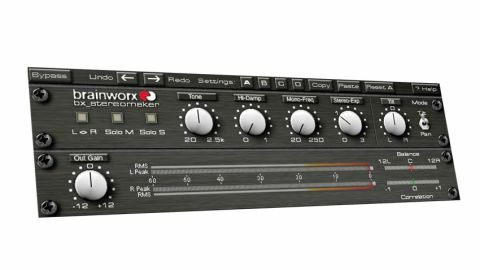 Particularly useful for stereoising beats and thickening basses, bx_stereomaker is a powerful mixing tool. Quick results. Flexible mono filter and stereo controls. Great for adding width to beats. Useful Tilt mode for image correction. Awesome on overdriven electric guitars. Low transients can flam. No integrated modulation. Of the main bx_stereomaker parameters, the most important is Tone. This has 11 settings between 20Hz and 2.5kHz, and is used to focus the processing on the selected frequency. "The overall stereo image can be shifted 'as one' using the Pan control, or you can switch to Tilt mode to shift only the effected part of the signal"
You can also curtail the processed element with the High Damp (set at 5kHz) control, and mono the overall low frequency content below a set point (20-250Hz) using the Mono Frequency control. Following this, you've got your more typical mono/stereo image control (Stereo Expansion). The overall stereo image can be shifted 'as one' using the Pan control, or you can switch to Tilt mode to shift only the effected part of the signal. Both the stereo and mono elements of the output can be soloed (Solo M and Solo S), and the overall left/right image swapped (LR). Rounding things off are RMS/Peak level meters, as well as balance and correlation meters. Finally, there's an output gain (+/-12dB) control. "Our first port of call for testing is an electric bass and bx_stereomaker works really well on this sort of sound"
An important thing to appreciate about bx_stereomaker is that it only works on mono signals, so even if you feed it a stereo sound, it'll mono the input signal by summing the left and right channels. Our first port of call for testing is an electric bass. bx_stereomaker works really well on this sort of sound, applying a lovely thickening effect when lower frequency Tone settings are used. Even so, the width enhancement isn't predictable, and by switching through adjacent settings you can quickly move from lots of extra width to not much at all. Switching to a mono synth bass, we found the effect worked best applied to the upper mid frequencies. Moving on to a kick drum and the lower Tone settings can introduce flamming to the sound if the transient is particularly sharp. But in that case, you can still add width in the higher frequencies. Here, the Mono Frequency filter comes in handy, particularly with higher Stereo Expansion settings. With snares and claps, we had no flamming issues other than at the lowest Tone settings (20 and 40Hz). Above that, the 80 and 100Hz settings work really well, making bx_stereomaker very good indeed at adding width and space to backbeats. On electric guitar, we found that clean sounds could come across as sounding a bit too artificial, particularly at higher width settings. In contrast, driven sounds work really brilliantly, and although there's no replacement for properly double tracked guitars, bx_stereomaker delivers convincing width and good mono compatibility. Finally, the plugin also works quite well with vocals in small doses, although as with all vocal processing, the context is important. Overall, we really like bx_stereomaker. It's simple, quick but effective, and particularly impressive when there's plenty of mid-range to enhance (guitars, snares, claps, etc). Highly recommended, then.